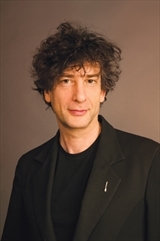 Dog Eared Publicity is pleased to bring you Neil Gaiman’s AMERICAN GODS, ANANSI BOYS, STARDUST and NEVERWHERE virtual book tour November 7 – December 2! Now a major motion picture—this charming fairy tale by the #1 New York Timesbestselling author, weaves a magical story set long ago in the tiny English village of Wall, a place where things are not quite what they seem. Tristran Thorn promises to bring back a fallen star for his beloved, the hauntingly beautiful Victoria Forester—and crosses the wall that divides his English country town from another, more dangerous world of lords and witches, all of them in search of the star. Rich with adventure and magic, Stardust is one of master storyteller Neil Gaiman’s most beloved tales.